Having stocked my mom up with apples (and dropping our dogs off with her prior to skipping town for a night) to make apple butter, she had this lovely creation waiting for us on our return. Needless to say, I cook like my mother: in mass quantity and with lots of love. We left in food coma. Preheat oven to 350 degrees. Butter a 9 x 13 pan (or 9x9 pan if you want more apples to crisp) for a thinner dessert with a 50/50 ratio apples/crisp. Core, peel and slice (1/2-3/4" slices) apples and toss with zest, juice, sugar & spices. Add apple mix to baking dish and set aside. Combine flour, oats, sugar & salt in a medium mixing bowl. Add melted butter and stir until crumbly in appearance. Top apple mix with crisp. Bake for 45-60 minutes depending on what size pan you used. 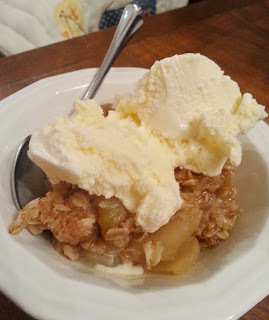 Your crisp is done with the juice has thickened, the apples are tender, and the oatmeal topping is a golden brown. Serve with ice cream or fresh whipped cream.